Physical activity plays an important role in maintaining independence and improving the quality of life for older adults. It does this by helping people to maintain healthy bones, muscles and joints. It decreases the risk of injuries and falls. It also reduces the impact of and development of conditions such as osteoporosis, type 2 diabetes, depression and cardiovascular diseases. 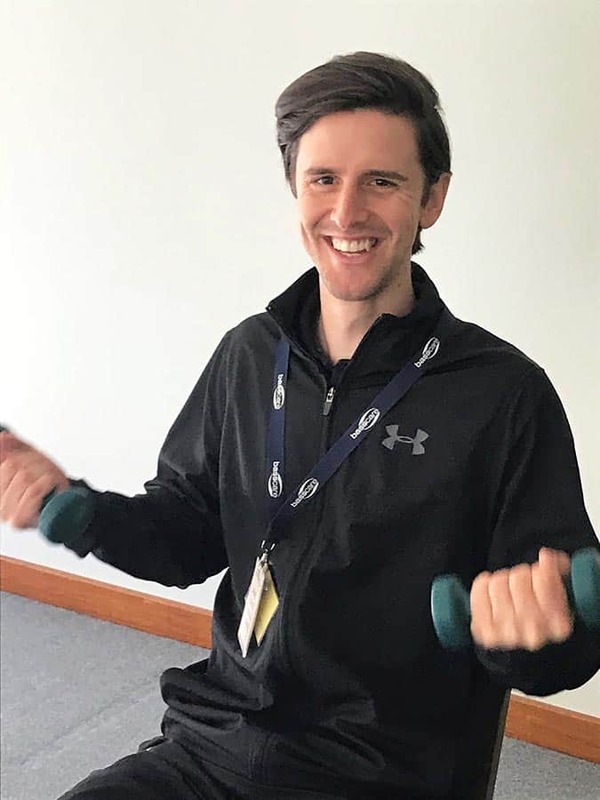 Tom, one of our exercise instructors at the Canterbury shares why it is important for us to stay active as we age, and how an exercise class at BASScare can help. How long have you been running classes at BASScare? I have been apart of the BASScare exercise team for about 2 and half years now having come from an Exercise Science and Personal Training background. How much exercise do we need as we age? Each individual will have different needs and capacity for exercise. In general it is advised that older adults try to accumulate at least 30 minutes of moderate intensity physical activity on most, if not all days of the week. Doing a range of physical activities that incorporates cardiovascular fitness, strength, balance and flexibility. It is advisable to chat to your doctor or health care professional to know how much and what kind of exercise is right for you. What are the benefits of structured exercise classes? There are a variety of benefits of a structured exercise program but most importantly is make sure you are performing exercises in a controlled and safe environment. They can help make sure that you are getting the best possible results and learning the correct movement patterns and techniques. What does the fall prevention class cover? The ‘No Falls’ class is a 15-week program covering the key components of fitness that relate to preventing falls and keeping active. These include increasing strength, improving balance, improving flexibility and increasing confidence. It is also a great way to socialise over a tea and coffee and to learn about what environmental and lifestyle factors can contribute to falls and how to prevent them through a variety of informative education talks. Do you need any special equipment to stay fit? Although there is a lot of great equipment available these days you can also get great results using your own body weight or small amounts simple equipment such as balls, therabands and ankle weights. What challenges do people encounter exercising as they age? As they age people may find themselves having to overcome some form of physical ailment or medical condition but I find one of the biggest challenges for people is gaining the confidence to give it a go. To override their own mindset of what they are or what they could be capable of. Who comes to your classes? I am extremely lucky to have a number of great groups of class members ranging from different backgrounds and exercise experience. They range from younger members looking to compliment their other exercise activities up to members in their mid-nineties. Any advise on keeping fit as we get older? I would encourage people to keep trying to do the things that they love but also to get out there and give a variety of exercises and activities a go. Exercise is also a fantastic way to meet people and keep in touch with friends, so it’s always great when you can keep active with others or be a member of exercise group or club. BASScare runs a range of exercise classes from Monday – Thursday each week at the Canterbury Centre at 2 Rochester Road Canterbury and the Marwal Centre at 9 Marwel Avenue North Balwyn. Call 9880 4709 to book or find out more information.